This floor takes a little extra effort and some patience but is a beautiful look when done. After cleaning the floor properly you will apply two coats of our Armor II commercial epoxy base coat in white. Then apply the bright white topcoat. It will be three layers of white in total. That’s how you get the ultra bright white floor that won’t yellow. Then you will mark out in pencil the black squares. The squares in this floor are 23″ square. If you have a laser it will make the job a lot easier to get the lines straight. We recommend you use 3M pin-stripping tape to avoid bleed through. This is where the extra effort and patience comes in. Getting the tape lines down straight is crucial to having the floor look symmetrical when done. Once you have all the squares taped out you will apply the black in one thick coat using a good 3″ cut in brush and a 4″ roller. Take care not to get black paint into the white squares. It’s a good idea to have some Xylene handy in case you do you can clean it up right away. Let the black epoxy dry about five hours and then remove the tape. That’s it nothing complicated, it just takes some extra time and a little patience. 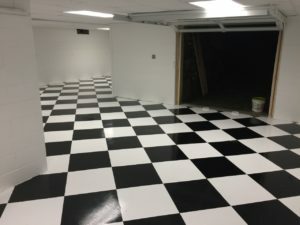 The Products used on this floor were the Armor II Commercial Epoxy Paint in bright white and the black topcoat. To order just select this option in the Color drop down menu.